Geshe Thupten Phelgye was born in Kham, Tibet, in 1956 and grew up as a Tibetan refugee in India. 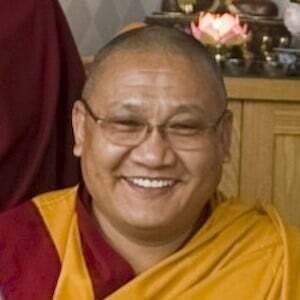 He became a monk at the age of seventeen, entered Seraje College of Sera Monastic University for the traditional 18 year course of study and finished his Geshe degree (Ph.D.) in 1991. He continued studies at Gyume Monastic College from 1993 to 1997. Then he completed a five year meditation retreat in the mountains of Dharamsala under the guidance of His Holiness the Dalai Lama. Geshe Phelgye is the founder of the Universal Compassion Movement, which advocates for vegetarianism around the world. He has served as a member of the Tibetan Parliament in Exile to represent the Gelug tradition of Buddhism. In addition to giving Buddhist teachings, he travels the world advocating vegetarianism and Universal Compassion for world peace. Geshe Phelgye is active in interfaith dialogue and was named an emissary for peace by His Holiness the Dalai Lama in 2004. In additional to teaching widely in America, Geshela is a Global Scholar and Mentor-in-Residence at Eastern Washington University. See photos of Geshe Phelgye at Sravasti Abbey.